Set off with high spirits and a light pack. 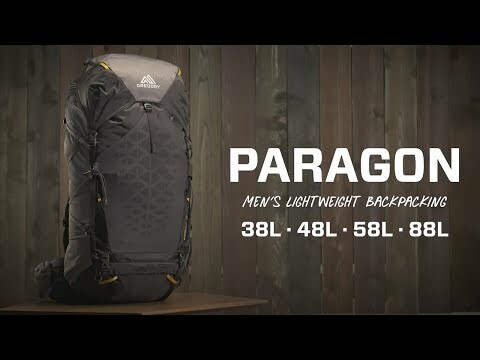 The Paragon line is Gregory's lightest series of packs for backpacking and hiking. The 38 boasts moderate capacity for a lightly packed overnight trip. The suspension system keeps it stable enough for scrambling, and the pockets will help keep you organized. Made of lightweight yet abrasion resistant 210-denier ripstop nylon. Aerolon suspension uses an ultralight, hollow aluminum frame that is flexible yet supportive. Contoured hipbelt and shoulder straps are padded with multi-density foam. Access through top or bottom zippered compartment. Shockcord and loops hold your trekking poles. Maximum recommended cargo weight is 18kg.